South Stack Cliffs Giant Puffin Seen at South Stack! Last Friday the RSPB South Stack Cafe hosted a children's birthday party for one of our young Wildlife Explorers. Our Catering Manager John and Assistant Catering Manager Rhian provided some wonderful home-made locally sourced food - sandwiches, sausage rolls, mini hot dogs, pizza baguettes, cheese straws, chicken goujons, trifle, jelly and a birthday cake! 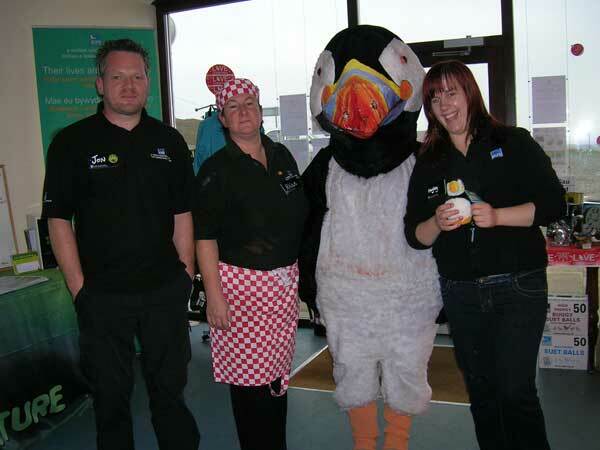 Hayley, one of our People Engagement team helped entertain the children, and the party was visited by a giant puffin (Laura, one of the Catering Assistants)!